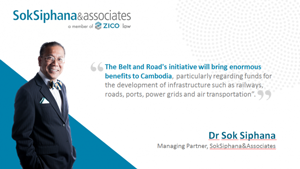 Dr Sok Siphana, Managing Partner at SokSiphana&associates (a member of ZICO Law) gives his take on the significance of China’s Belt & Road Initiative on Cambodia. He explains why the initiative will provide new opportunities for Cambodia to expand bilateral trade and will draw interest to Chinese investors. Learn more about what Dr Sok Siphana has to say about The Belt and Road Initiative at //news.xinhuanet.com/english/2017-04/28/c_136244189.htm.